The new HELSTAR CD opens with a spritely (if a bit repetitive sounding) intro on "Fall Of Dominion". After a brief spoken word piece, things kick into overdrive on a song that uses vocalist James Rivera to launch a throaty rant that would seem to be attacking government and society as a whole. As a big fan of Rivera's vocals (especially the SEVEN WITCHES album Passage To The Other Side), I loved getting to burn his mix of classic power metal clean power vocals and the more viciously brutal thrash screaming style into my brain once more. On "Defy The Swarm", the fast and utterly relentless style is aided by Rivera just spitting out the lyrics in a way that reminds me of OVERKILL's Bobby "Blitz" Ellsworth. Musically speaking the album sounds great as guitarists Larry Barragan and Rob Trevino wrote or co-wrote every track. Rivera and drummer Michael Lewis aided in the writing on four of the tracks. The guitarists craft superb riffs and fuel every gut ripping solo with thunder and fury. The title track finds everyone involved alternating between the thrash to scramble your thoughts and the power metal style that lets you soar to new heights. Ex-NEVERMORE guitarist Jeff Loomis teamed up with Barragan to write the instrumental "Isla De Las Munecas". I'm not always enthused with instrumental music, but this fast paced piece manages to display a degree of subtlety to give it a different feel than most songs of its kind. The band slowed things down in terms of tempo with the song "Cursed" but a foreboding sense of heaviness made the song a winner. But I was disappointed with the closing track "Magormissabib" (and no that isn't a typo). It just felt more like a filler track that could've been left off the disc, and struck me as being completely out of place with the rest of the material on the album. While I did like the song "It Has Risen" overall, but the lack of vocal clarity during parts of the chorus was insanely distracting. If you didn't read the lyrics in the booklet you would never be able to figure out that Rivera used the words "Foretold" or "Foreseen". It was brutal and not in the good sense of the word. The production on the vocals for the song could've been done better. The best song on the disc however is "Souls Cry". The song is not as brutally intense as some of the other fast paced tracks, but I loved the overall vibe the song had and the vocal performance during the main lyrical verses was a really cool stylistic choice. All in all, This Wicked Nest is a solid addition to the band's discography. They may not be to everyone's taste, but when you drop this disc into your player, you can rest assured that you will not be disappointed. 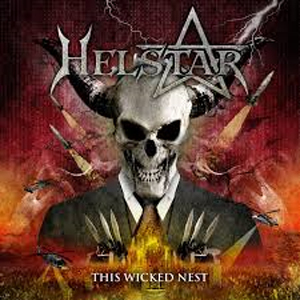 Pick up your copy of This Wicked Nest in the KNAC.COM More Store right HERE.